Cheesecake is one of my favorite things about life. And sometimes I don't want to spend an hour hovering around the oven window, crossing my fingers in hopes that the water bath is working. I want cheesecake without the fuss. This recipe is about as close to instant cheesecake gratification as you can get. I've taken my favorite no-bake cheesecake recipe and adapted it into a fluffy vanilla-bean batter that can be piped into ice cream cones like soft-serve. It's almost like cheesecake mousse. These cones are so very easy to make. If you are short on time and need something cold, creamy and delicious for a summer party - this just might be the ticket! Before I filled the cones, I dipped the rims in melted white chocolate and then into a mix of jimmies, nonpareils and jumbo sprinkles. The added color makes them look so fun and cheerful! Pour heavy whipping cream into a large bowl and beat on high speed with an electric mixer. Gradually add in half the granulated sugar and beat until soft peaks form. Add the cream cheese and beat again, gradually adding the rest of the granulated sugar. Add vanilla bean seeds or extract and beat until stiff peaks form. Transfer mixture to a piping bag fitted with a large star tip (Wilton star tip #133). Pipe batter into cones and into a large swirl on top like soft-serve ice cream. 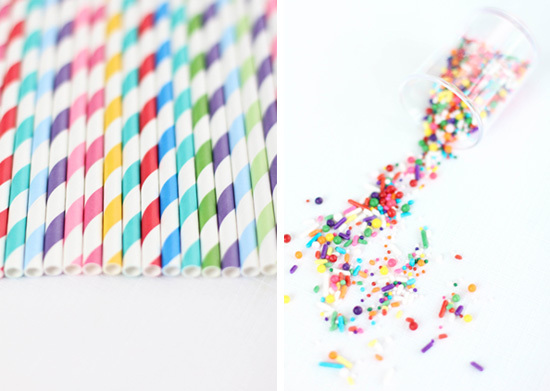 Sprinkle with multicolor nonpareils. Refrigerate until ready to serve. You could also freeze them for an extra frosty treat. Tip: To make these extra colorful, dip the rims of the sugar cones in melted white chocolate then into multicolor sprinkles. Place them on parchment paper and allow them to harden before filling with cheesecake batter. Never would have thunk! Yum. Oh this looks GOOD! I am seeing a trend of people making unexpected foods into cones these days and I have to say - I love it! these are SO cute and probably incredibly addictive! the sprinkles are beautiful! I never knew it was possible for cheesecake to become more awesome - you have made it so! Where do you buy straws like that?!? They're adorable! Also will be trying this recipe for sure :) Thanks! Best...Cheesecake...Idea...EVER! I'm totally freezing mine. These are so pretty! Perfect for a party! omg, this is so cute and pretty! and it sounds delicious! so adorable and I'm loving the old-fashioned straws. Ive been resisting the urge to order some online but cannot find them in stores. So cute! De licious and so pretty! A great idea. I make cheese cake a very similar way! Its all the flavour without the fuss :) I love it in the cones! Such a sweet idea! Easy cheesecake? Count me in! Love these pretty cones. WOW what a fantastically inspired idea. Love it!! Cheesecake...MOUSSE. You mean delicious, luscious cheesecake in a light heavenly-like mousse consistency. Oh, la.la. Now I'll never look at what the ice cream truck comes around with in hope again. Not when these as a possibility! Congrats on the book launch!! Oh boy....these look so freaking fabulous! Love this idea! Such a good idea! And I'm super crazy about the sprinkle rim on the cones. Skillz! Just spent an hour browsing your blog...I absolutely adore it! You've done such a nice job...Congrats on your book! Very inspiring for us hopefuls out there! This is brilliant. Cheesecake is my husband's favorite but he despises waiting for it to bake and then cool. I love this! By the way, if I didn't havea need to eat them all right away, would putting them in the freezer be ok for storage or should I stick to the fridge? I'm afraid the cones would get soggy after several hours in the fridge. I'd freeze them, then let them stand for a little while at room temp before serving -if you prefer the soft "mousse' texture. Shut the front door! What a fabulous idea for cheesecake!! I LOVE it! Oh goodness, they look marvelous! So whimsical, creative and delicious! I'm loving the look of these little cuties! I can't wait to try this recipe. We started making our own cream cheese last month and this would be perfect. How adorable! And fun for kids! these are so cute!!! the kiddos would LOVE them :) AND I can't wait to try the cheesecake "mousse" in my cakes and cupcakes yummm! 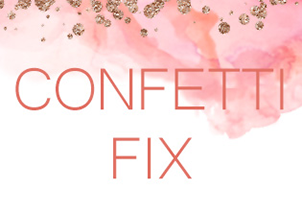 I'm currently obsessed with stuffing cones and this is a great idea. Cool presentation too! Wow!! Such a great idea! Can it be used as a filling in that wedding cake you posted? What a genius idea! These would be perfect for children's parties. Totally genius! LOVE LOVE LOVE this. Thinking of trying with a lemon cheesecake mix too and love the white chocolate and sprinkles finish. Good enough for a wedding dessert IMHO. Now that is a clever dessert idea! 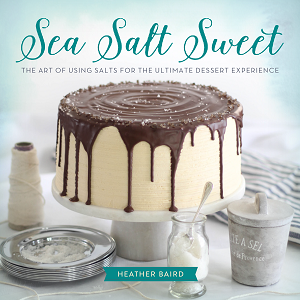 Heather, this is such a wonderful idea, and perfect for parties! I don't know an adult and child alike who wouldn't smile at the site of this. Ummmm...so...yeah....you are my hero. These are super genius! I absolutely LOVE your blog! 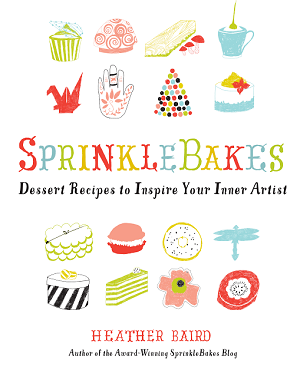 Such a huge sprinkle bakes fan! I wait for your next post every few days! This looks completely delicious! 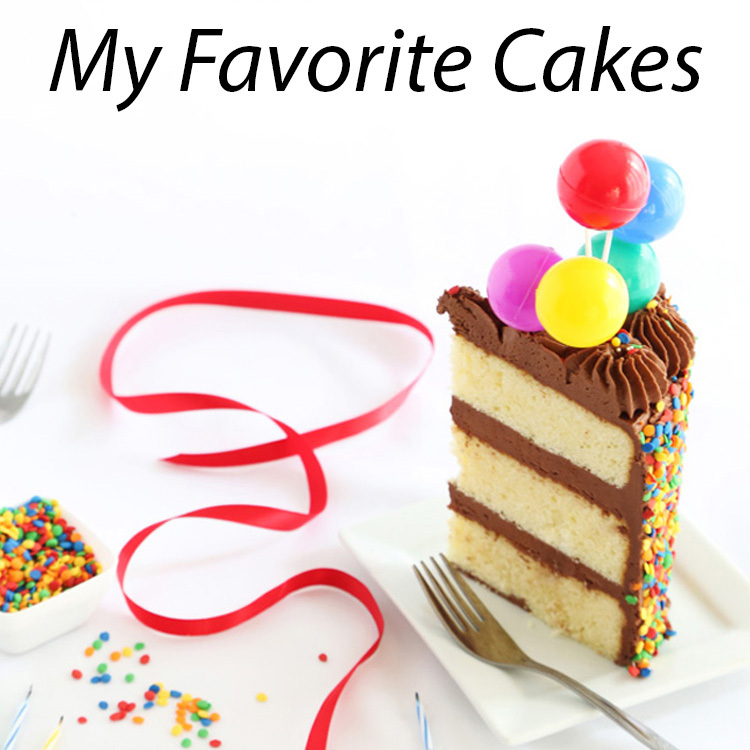 If you wouldn't mind, I'd be so stoked if you checked out my baking blog! Simply fantastic. I discovered your blog and...I love it! 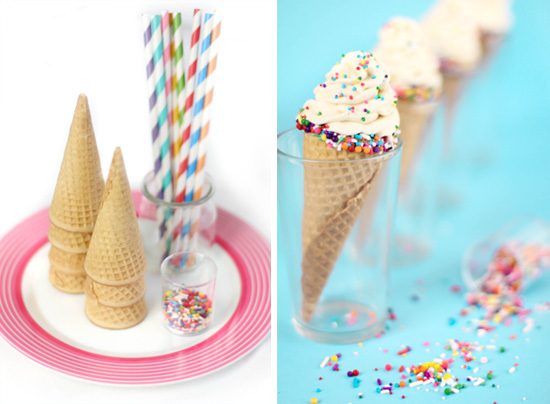 I've had ice cream cone desserts on the mind lately, too! These look so good... kind of like the American answer to cannoli! My hubby is a cheesecake freak. I have to make these for him now. I have made other yummy stuff in cones, but not cheese cake, what a brillinat idea. Really want to try this recipe as a topping for cupcakes where cream cheese buttercream would normally be used. Looks like a very straightforward recipe too! This is a fabulous idea. I wish I had thought of it. My daughter loves cheesecake and with her bday coming up in August I think I will make these. Thanks for the inspiration! Delicious! I nominated you for the Food Stories Award (foodstoriesblog.com) because we love your site. You're a wonderful writer! I love these! Would be great for a kiddos bday party! This is a genius idea! Soft serve cream cheese ice cream in no time! Sign me up! Wow, I'm new to your blog and am now hooked! beautiful photos and creative recipes!! 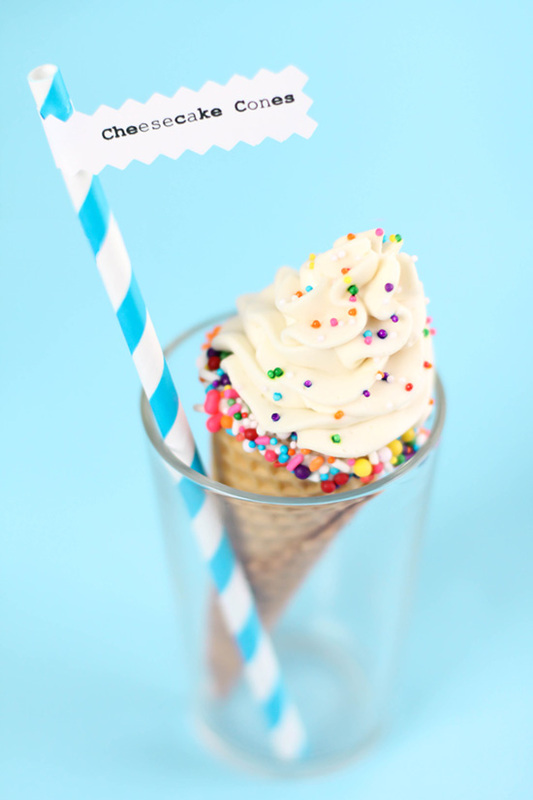 This is such a fun idea, I am sure this will be great for a party and the kids will love it too! Going through your posts is a dangerous and dreamy way to spend a rainy day here! I can't wait to make these for my moms surprise party!! This looks amazing. I need one now!!!! 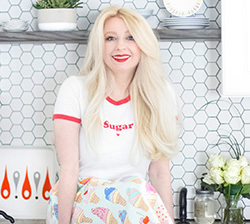 Heather, I love your recipes! I have tried a ton and they all turn out gorgeous and delicious! It's always the talk of the party. I send everyone to your blog. I feel like an idiot on this recipe though, it keeps falling. I.can't seem to get it right. Could you help me with what I may be doing wrong? Thanks, I'm dying to try these :). Sorry you're having trouble! Can you tell me what happens? Is the mixture not whipping properly? DO you know that I was on a plane to Seattle and I had a brilliant idea to make cheesecake in a cone and I wrote it down in my notebook and put a little smiley face next to it because I knew it would make me famous? THEN I turned my phone on when I landed and opened up facebook and saw that you stole the insides of my brain while I was flying and created an even more gorgeous cone than I could have ever dreamed? And I have to tell you that I am so totally jealous that I didn't get to go to Seattle and hang out (eat donuts) with you guys. I might have cried a tear. I tried this recipe this past weekend, the cones turned out great but the mixture did not, I made it three times and turned out terrible.....Oh well, better luck next time! Hi Ashley! Hard to say what happened. What do you mean by terrible? Taste? Didn't set? No it becomes runny like it fell. I waited for a soft peak to form and added 1/4 sugar, but after that it seemed as though the peaks were stiff, so when the cream cheese was added it just got really runny. I know I'm doing something wrong, I just don't know what it is. I'm somewhat new to baking. I've learned most I know from you :) you're like my baking idol :). Thanks for trying to help. I so want to try these babies out. Once it was in the fridge, it wasn't runny anymore, and was really delicious, but I couldn't build the cone that high because the mixture was runny. Another thing that may have happened was maybe the cream cheese was too warm--I made this right when I came back from the store. Definately trying again...it was still VERY delicious!! Thanks for the tutorial! The reason why I think it was the temperature that made it more runny was because the first cones I made were a bit firmer coming out of the decorating bag but the mix had gotten so runny by the end that it was everywhere lol. I love you guys but you're making me sad with all the runny cheesecake mixture. I may have some tips to help with this. Put your bowl and beaters in the refrigerator and let them get good and cold before you start. Make sure you get heavy whipping cream. It should have a milk fat content of between 36 and 40 percent. It should be cold. Don't soften the cream cheese in the microwave. Let it stand at room temperature until it loses some of its firmness. It should still be a little cold when you add it to the whipped heavy cream/sugar mixture. I hope this helps. I may have to bust out the video camera for a tutorial! These turned out so cute. I didn't have any problems with consistency, but I used the heavy whipping cream and non-microwaved cream cheese as you suggested to the folks above. And maybe some of those with trouble are trying to use the paddle attachment instead of the whisk in their mixers? I can't wait to do this filling with orange and black jimmies in little shot glasses for Halloween. Thanks for a lovely idea! 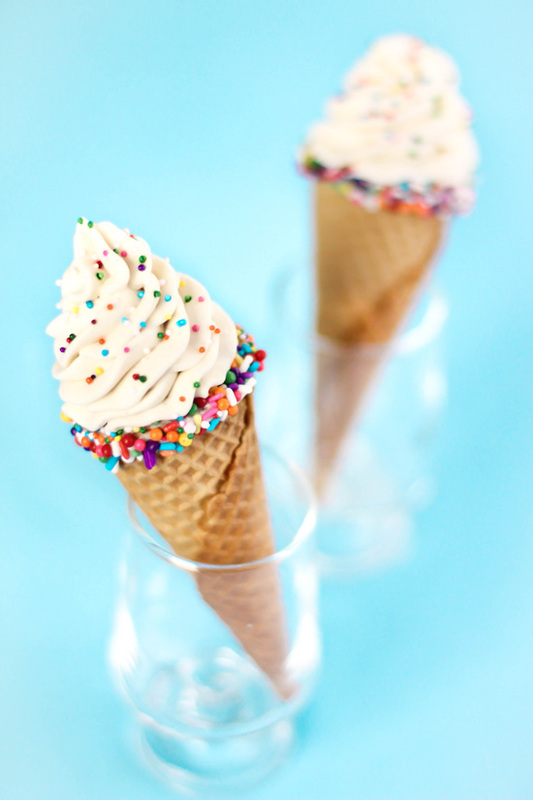 These are so cute, they make me smile and I love the dipped rims of the sugar cones! Wow! I really like the idea of these because cheesecake can be so heavy. The cones look light, like soft serve. And I like any excuse to avoid a water bath. Making these this weekend! Yummy!